Members of the Class of 2016 arrived on campus for Convocation on Monday, August 27, and were welcomed by President Lee C. Bollinger and Dean James J. Valentini, among other speakers. They came from 48 states and nearly 60 countries and represent almost 90 prospective majors, according to the dean. This year’s program also featured the first Alumni Procession at Convocation, with approximately 75 alumni grouped by decades marching behind banners to rousing applause from the students, parents and guests. A theme among the speakers, who also included Dean of Student Affairs Kevin Shollenberger, New Student Orientation Program coordinator Briana Saddler ’14, CC Alumni Association President Kyra Tirana Barry ’87, SEAS Interim Dean Donald Goldfarb and E.V.P. 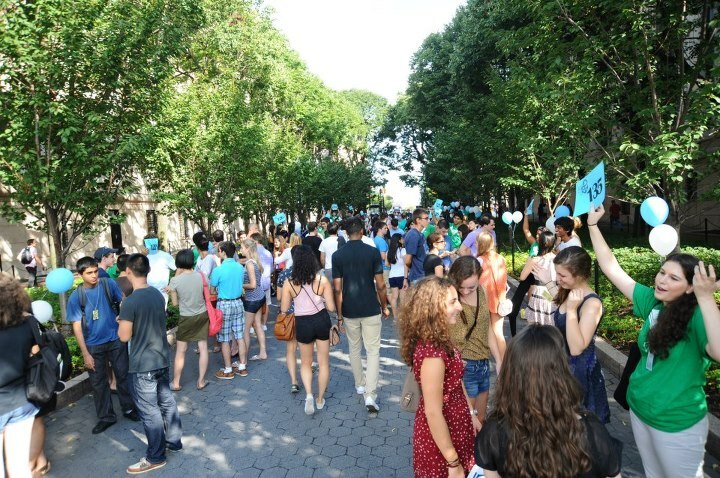 for Arts and Sciences Nicholas Dirks, was an exhortation to the incoming students to make the most of the next four years and the myriad opportunities available to them both at Columbia University and in the city of New York. The New Student Orientation Program, with programming including the “Class Act” variety show, information and advising sessions, and tours of campus and the city, began immediately following Convocation and continues through the start of classes on Tuesday, September 4.